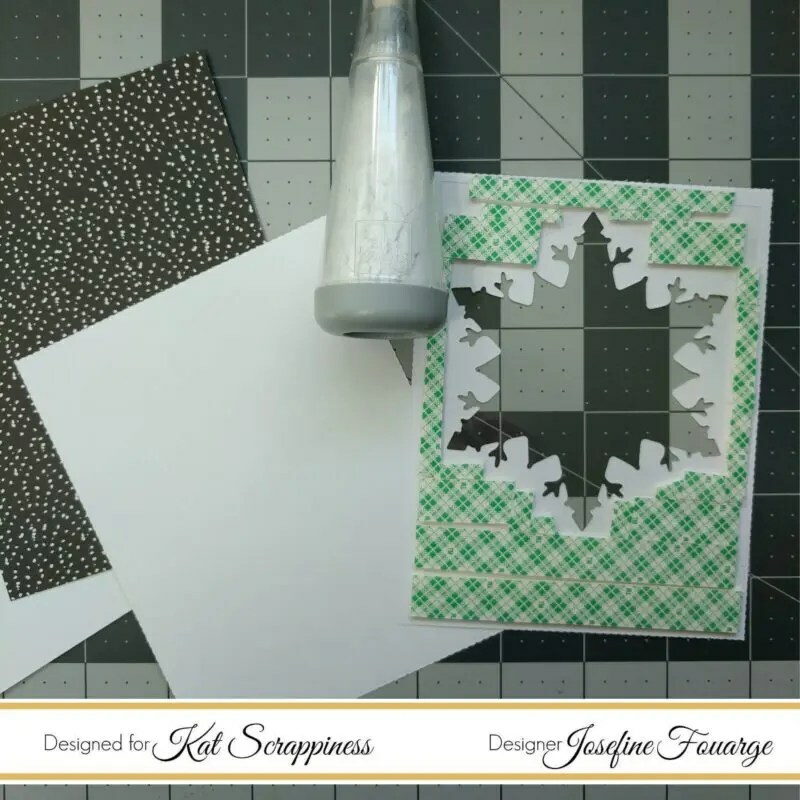 As soon as I saw this amazing snowflake die, I knew that I wanted to create a shaker card with it. 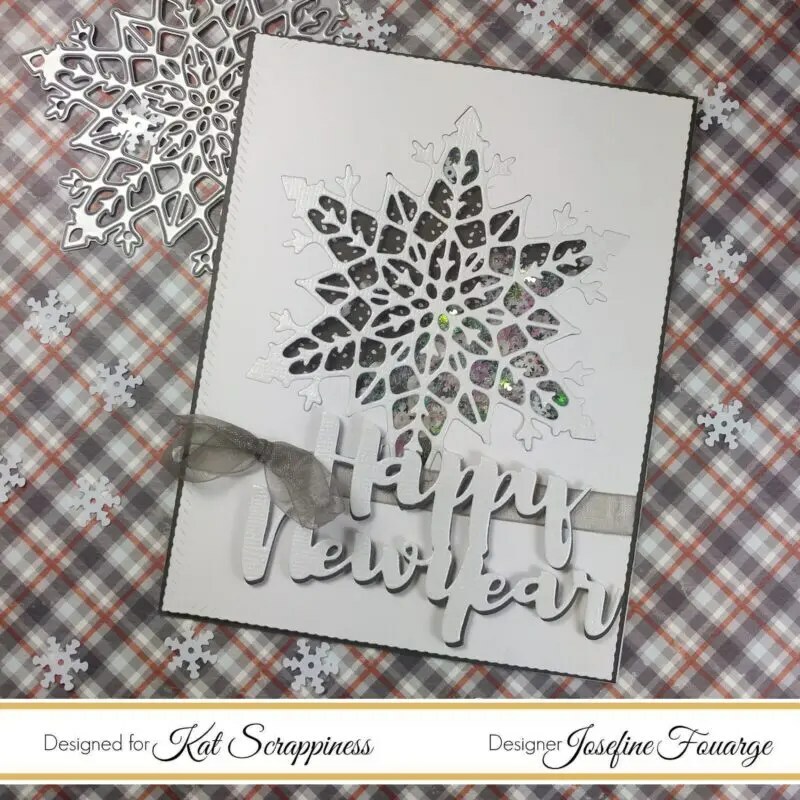 I think snowflakes are glamorous, so I paired it with the Happy New Year die form Kat Scrappiness and some shiny sequins. 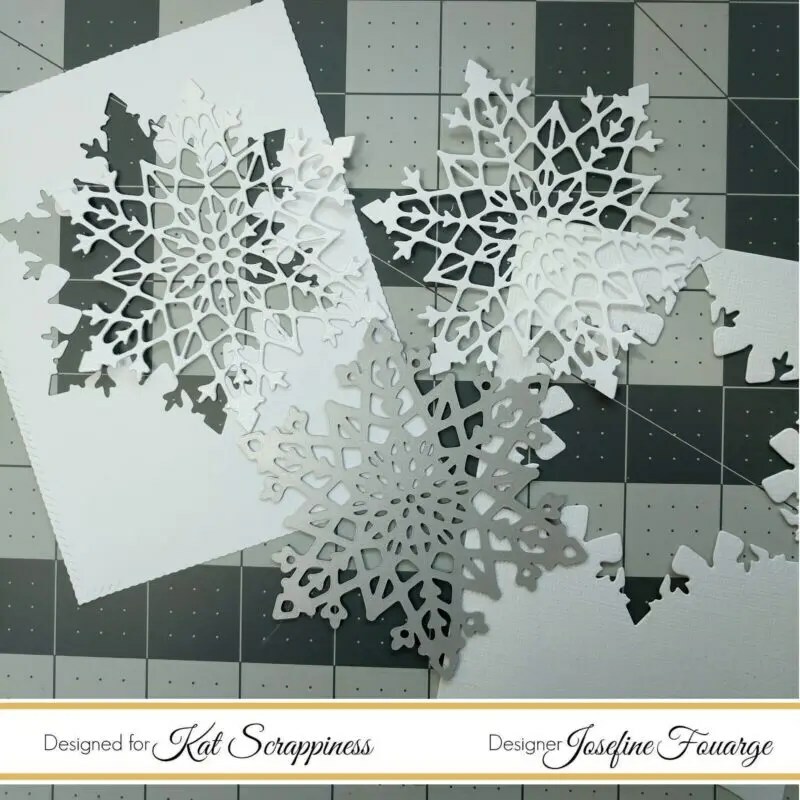 First I had to die cut the snowflake, once from regular white card stock and a second time from shimmer card stock. The white card stock is my front panel and I used the shimmer card stock for the die cut inlay. Then I created the shaker part. I adhered a piece of acetate to the backside of the front panel and added one layer of foam tape. The sequins I’m using are rather flat, that’s why I didn’t double up on the foam tape. To keep the sequins from sticking to the side, I prepped the foam tape edges with the powder tool. I added several sequins and adhered the back piece which is a piece of patterned paper from a Carta Bella paper pad on top. To add a little more interest I tied a piece of ribbon around the shaker panel. The sentiment was cut twice. I created a shadow with dark gray paper and used the same shimmer paper for the top. Now I adhered the sentiment to the bottom of the card. I used foam tape again, just to give it a little more dimension. Finally, I added the shaker to a gray piece of card stock and both to the card base. 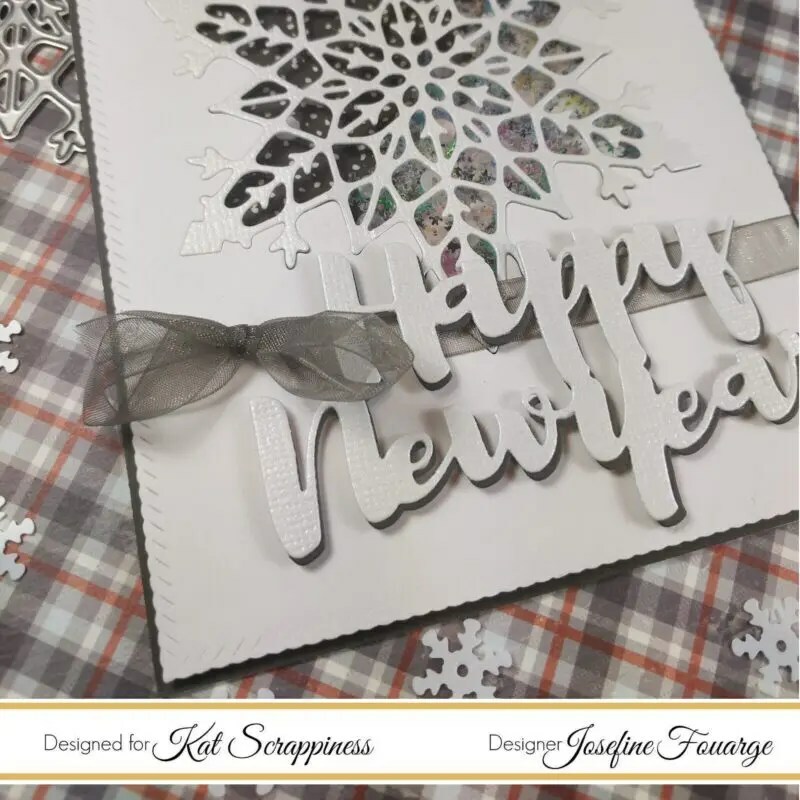 Kat Scrappiness – Snowflake Kisses Sequin Mix – Shaker Card Fillers – NEW! 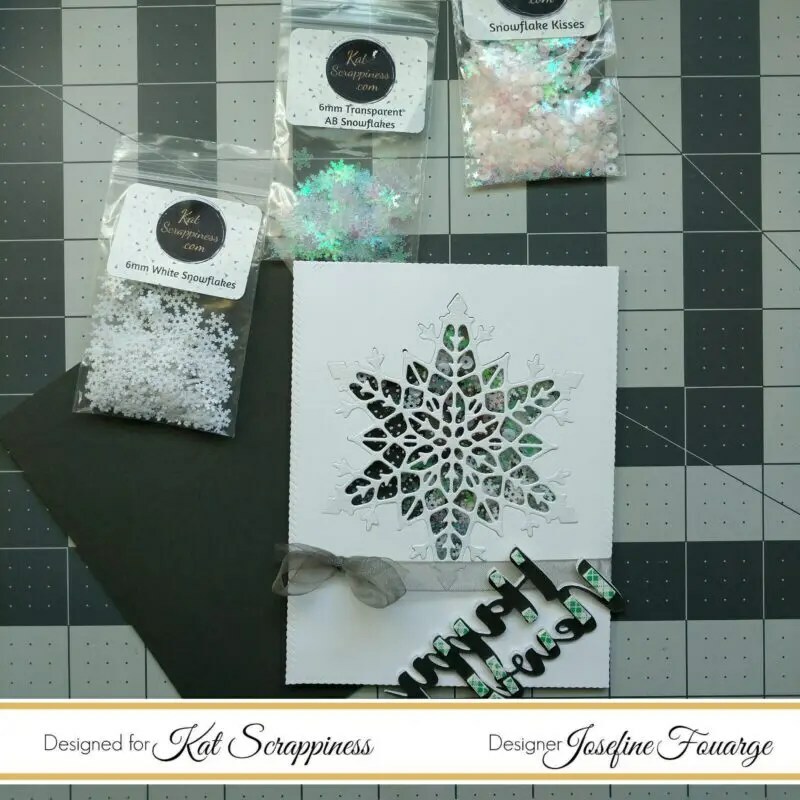 Kat Scrappiness – 6mm Small White Snowflake Sequins – NEW! 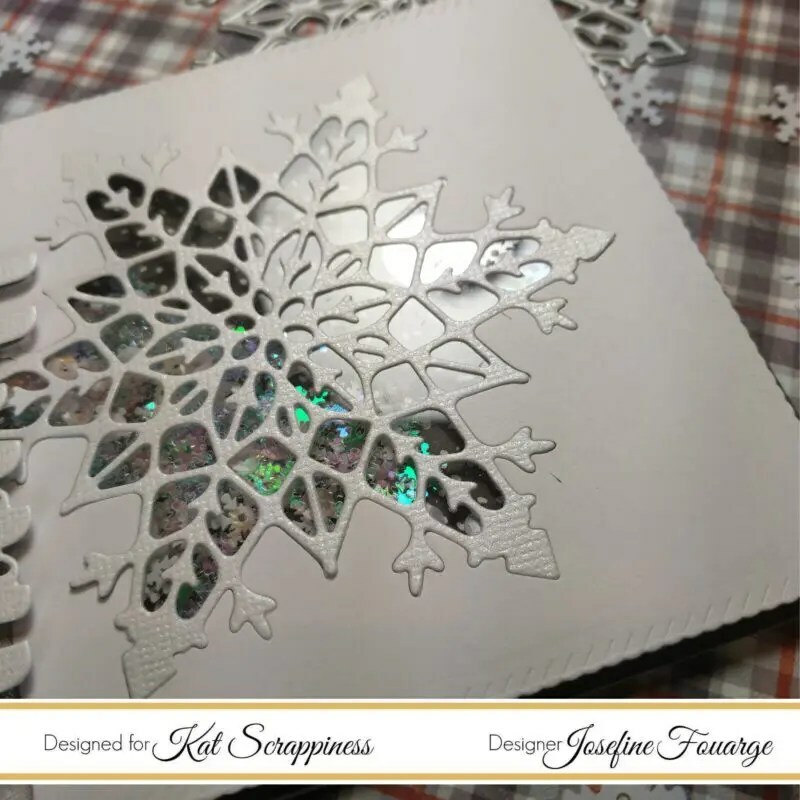 Kat Scrappiness – 6mm Transparent AB Snowflake Sequins – NEW! Hi, I’m Josefine. I was born in Germany but moved to the US about two years ago. I’m living with my husband and our little Rat Terrier in California. Both are very supportive of my hobby ? I started crafting about the same time I came over here. I was bored while waiting for my Green Card, so I started watching YouTube videos and got hooked on card making. Now I’m also interested in mixed media and art journaling. I’m super excited to be part of the Kat Scrappiness Design Team and can’t wait to share all the creations with you. It’s gorgeous Josefine! Wish you and your family a very happy new year!